The patented Blended Aftertreatment System (BATS) is a unique concept developed by RPS partners Engine Fuel and Emissions Engineering (EF&EE) and Clean Train Propulsion (CPT) that allows EMD locomotives fitted with HEP generators to meet current emissions requirements without replacing the proven and reliable 645 and 710 main engine. The key to the concept is combining the HEP Exhaust with the main exhaust in order to facilitate mixing and delivery of the dosing agent (Urea) to optimize the emissions reduction for both engines. The system consists of Compact Selective Catalytic Reduction (CSCR) with a Urea storage and injection circuit, respective exhaust ducting, and a system controller that monitors and dispenses the Urea as a function of system load. The below schematic shows the system architecture (shown in green) specific to an F59PH. The RPS kit is an improvement to the EF&EE ‘Compact SCR’ system previously tested in service with Metrolink. The ‘Blended Aftertreatment’ kit incorporates the lessons learned from this testing and includes new content that combines the HEP exhaust with the main engine exhaust prior to the ‘Compact SCR’ thus improving the overall system performance by reducing the emissions from both the main and HEP engines. 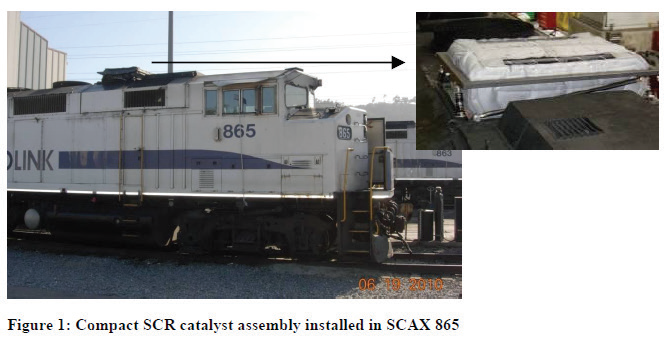 The operation, reliability and performance of the Compact SCR in the Blended Aftertreatment System is supported by over a year of combined testing and commuter rail service as part of a demonstration effort for Metrolink performed in 2010. Emissions improvement estimates of the ‘Blended Aftertreatment System’ are extrapolated from years of SCR testing in both on and off road applications. When combined with a Tier 0+ main engine overhaul and Tier 3 HEP engine upgrade, the Blended aftertreatment system allows the main engine to achieve Tier 4 NOx and Tier 3 PM emissions levels and the HEP engine to attain greater than 96% NOx reduction as well as reducing engine noise during operations. Additional patent pending upgrades to the Blended aftertreatment base system including a Diesel Particulate Filter (PDF) for the HEP exhaust, further improving the emissions levels ans power electronics upgrades that will link the HEP Generator and Main engine providing added power and limp home capability.